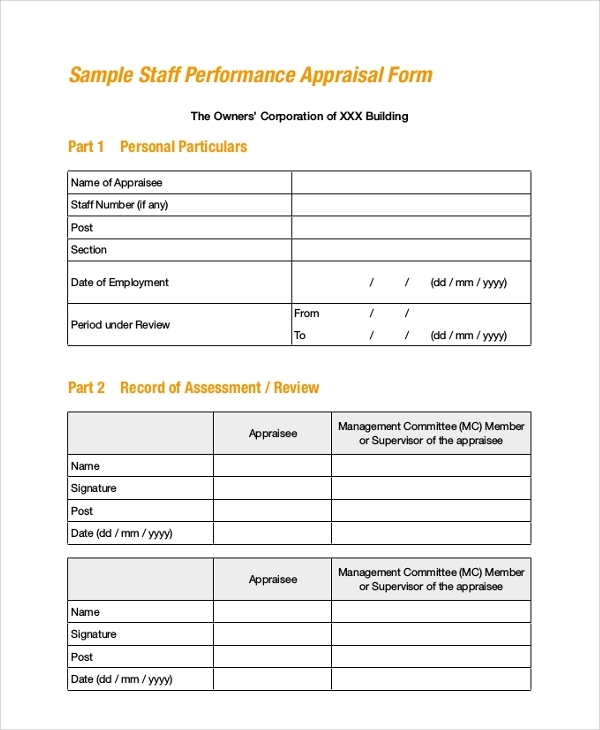 An employee self-appraisal form, is a form prepared by the employer or the evaluator for employee to fill in the information requested as a way of evaluating their performances. The evaluation is done periodically. 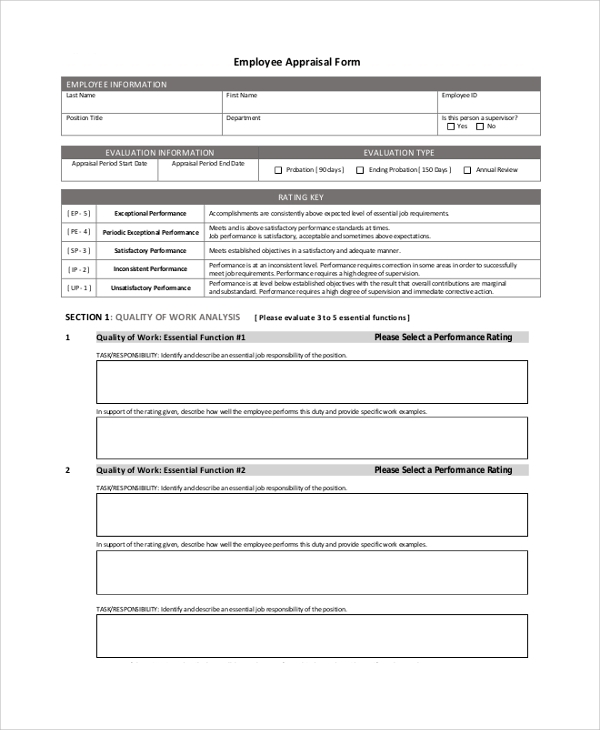 Employee appraisal Review form An employee appraisal review form is prepared for reviewing the conduct and the performance of the employee performance according the objective of the company they are under. The from helps the employers to carry out review process. The sample of the form can be accessed from our site for free. 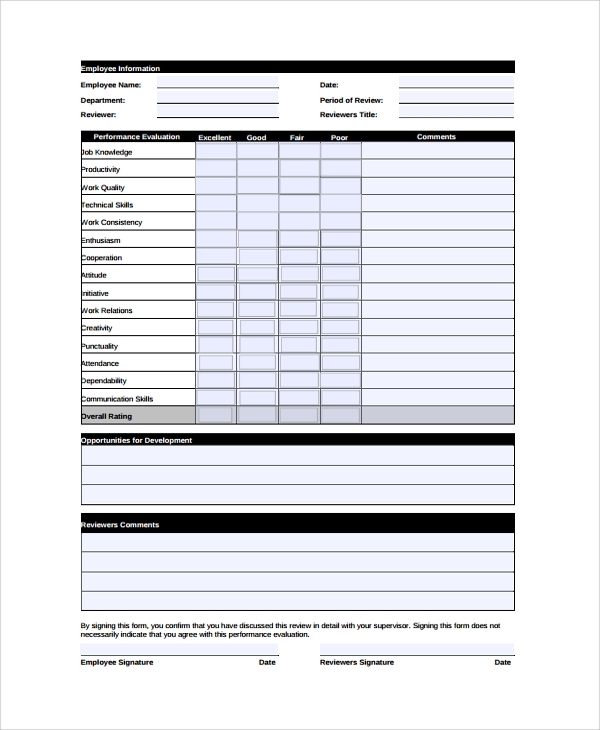 An employee appraisal review form is prepared for reviewing the conduct and the performance of the employee performance according the objective of the company they are under. The from helps the employers to carry out review process. The sample of the form can be accessed from our site for free. 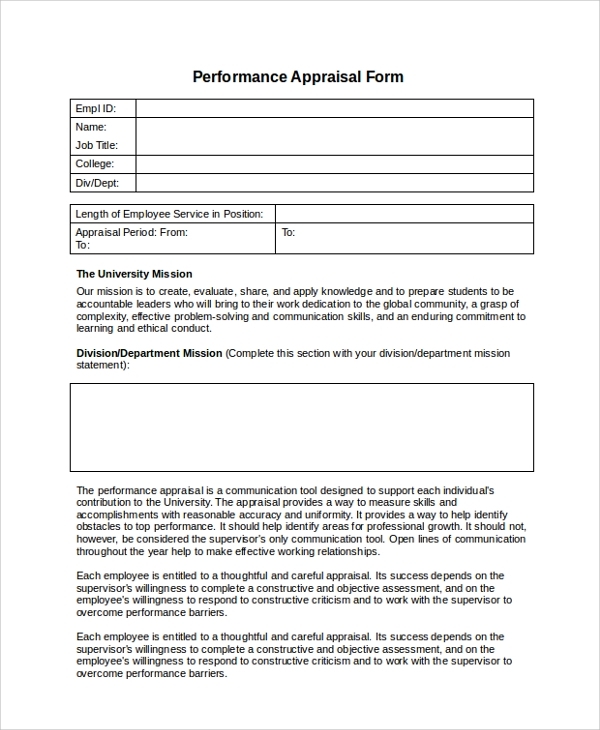 This is a form to evaluate or appraise the performance of the staff. The form is used after a period of time whenever the appraisal is carried out. The form provides assistance to the reviewer to easily track the performance of the employee. Why is an Employee Appraisal Form Important? An employee appraisal is important for both the employee and the employers. For employees they feel appreciated when their efforts are recognized. The employers are able to track the performance of a certain employee and they are able to figure out which employees are working and which ones are not. As for the employees, after their efforts are recognized they feel motivated and put in more effort to their work. 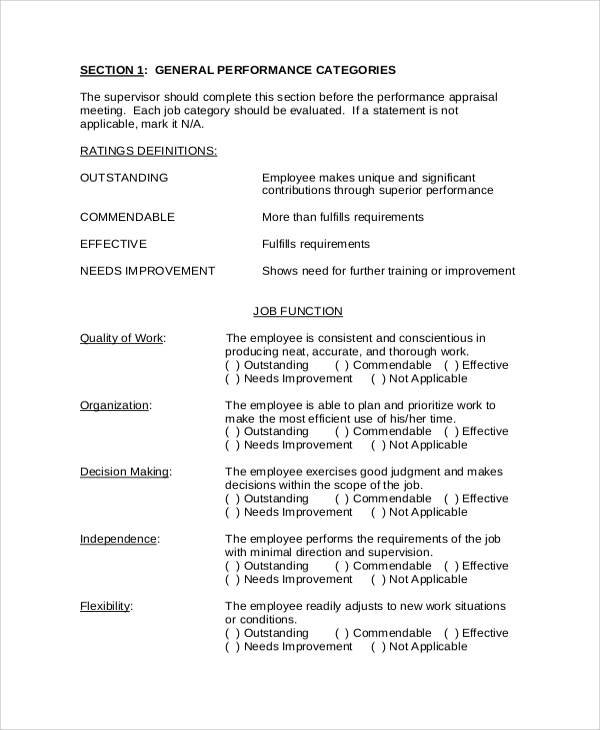 The Employee Performance Appraisal Form also helps the employers to know the weaknesses of the employees. They are able to understand if they need to train the employees on new skills or still help them develop the skill they already acquire. Who Needs an Employee Appraisal Form? An employee appraisal from is needed by both the employees and the employer. The employees need the form just to familiarize themselves with the information they should expect to find in the employee appraisal form. The employers need the form to help them easily conduct the appraisal effectively and get accurate results. With the form already prepared, employers can save time carrying out the appraisal and end up with reliable results. The employee appraisal form can be downloaded from our site for free and users can customize them to suit their own needs. Employee appraisal form has lots of benefits. It enhances a better communication between the employees and the employer as it clearly shows what the employee is doing better and what they’re not. The form also encourages employees to continue with good work since all of their efforts are noted and appreciated. 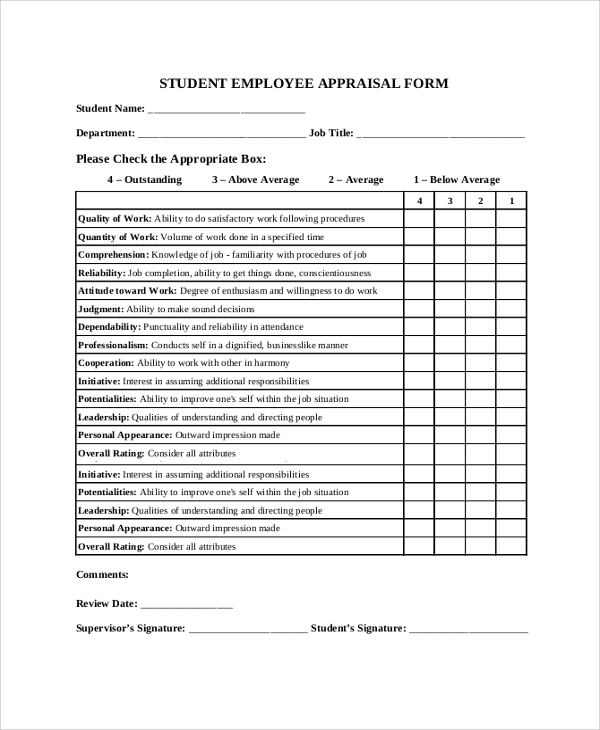 You may also see Sample Performance Appraisal Forms. Before carrying out the employee appraisal activity, looking for the employee appraisal form is highly encouraged. It ensures employee of gathering reliable information which can be useful for making the company decisions. The forms are also used by employers and the board to make decisions for the company.